A Jack offering money to the needy. He has plenty and is always on the look out for places to leave more. 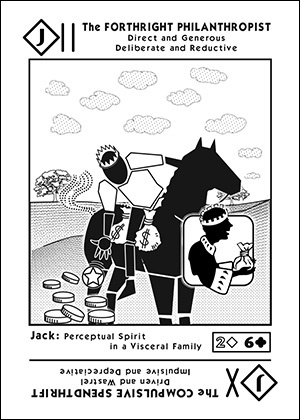 A Perceptual Spirit in a Visceral Family. Forthright, because, like the 2 of [+] he is deliberate in his actions. Philanthropist, because, like the 6 of [--] reversed he is not averse to the idea of subtracting from his accumulated wealth. Candid, because, like the 2 of [+] he is direct. Generous, because, like the 6 of [--] reversed he likes to give stuff away.